*Note: Blend 10 pandan leaves with about 275ml (9.35 fl.oz/1.16 cups) water and strain the juice out to get about 1 cup of pandan juice. A substitute for Pandan Juice for guests that do not have access to pandan leaves is: Mix 2 tsp. pandan essence with 250ml (1.05 cups/8.50 fl.oz) water. 1. Sift flour, cornstarch, baking powder and salt together into a mixing bowl. Add egg yolks, coconut milk, pandan juice, evaporated milk and pandan paste. Use a whisk to mix the mixture well. Add melted and cooled butter or margarine and mix well. 2. In a separate clean mixing bowl, whip egg whites at medium speed until egg whites produce bubbles. Add sugar and continue to whip at high speed until stiff peaks form. 3. Use a spatula to fold egg whites gently into the flour mixture until well blended. 4. In preheated waffle iron, pour approximately 1/2 cup (4 fl. oz/118 ml)* (see tip below) of batter onto the waffle iron. Cook approximately 6-7 minutes until brown and crispy. 5. 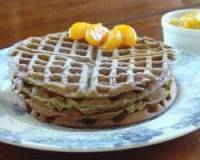 Serve while the waffles are still hot with Kaya, butter, peanut butter, or honey. *Tip: Adjust the amount of batter according to the shape/size of your waffle maker. 1. Addition of cornstarch into this recipe makes the waffles stay crispy longer. 2. After trying this recipe, I feel that I did not add enough oil. The waffles were a bit dry. You can increase (e.g. by 1 tbsp.) the amount of butter/margarine if you like. 3. Substitute evaporated milk with coconut milk if it is not available. 4. Do not fold the egg whites too much as this may break the "valuable" air bubbles that serve to make the waffles lighter. 5. Cooking times may vary with different waffle makers. Please adjust the timing according to the manufacturer's instructions. Cook waffles longer if you like a crispier texture. 6. The waffles actually are greenish in colour. However, this is not obvious in the picture shown above. 7. Unlike the western countries where accompaniments to waffles are butter, maple syrup, fresh fruit, ice-cream or honey most of the time, Malaysians consume this quick bread with butter and Kaya, a kind of spread/jam made of mainly Gula Melaka (coconut sugar) and coconut milk. Try this kind of combination if you have the opportunity. It will be very different! Pandan Paste, Pandan Essence and Kaya (Coconut Jam/Spread) may be purchased online at: www.zestyfoods.com. They are located in Colorado, in the USA. Coconut Milk may also be purchased at most supermarkets in the USA. It is usually found in the Asian Foods section. Also, Coconut milk, Pandan Essence and Pandan Leaves Extract may be purchased online at: www.asianwok.com. Asianwok is located in the United States. Recipe adapted and rewritten from "American Waffles" by Diana Baker Woodall of Diana's Desserts Website. I've tried it. Quite crispy and tastes good. Good. Did not think it was dry at all as commented by Diana. Used 4 tbsp of olive oil instead of melted butter/margarine. i haven't made this yet, but this sounds tasty already.